Welcome to Day 3 of my stamp spotlight on Chock-full of Cheer. Today's card is created using this super cute set in combination with one of my favourites, Lovely as a Tree. I wanted to showcase how easy it is to combine stamp sets and create beautiful projects. For this card, I used the pine tree from Lovely as a Tree and stamped only the top of the tree along the side and top of the card. This gives the illusion of a bushy branch. I then added the ornament from Chock-full of Cheer. 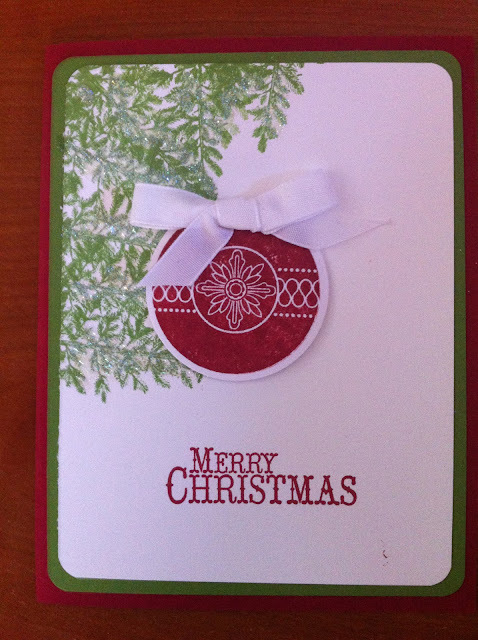 I popped the ornament up using Stampin' Dimensionals and added a bow using our 3/8" taffeta ribbon in Whisper White. Add a little frosting to your tree branches with 2-Way Glue and Dazzling Diamonds and voila, a simple yet gorgeous card that will have your family and friends oohing.